Place cereal in gallon-size resealable food-storage plastic bag. With flat side of meat mallet or rolling pin, crush cereal until very fine, making 1 1/3 cups crumbs. Place on large plate; set aside. In medium bowl, beat eggs, milk and vanilla with wire whisk until well blended. Spread 2 tablespoons peanut butter on each of 6 slices of bread. Sprinkle each with about 2 tablespoons crushed granola bars. Spread 1 tablespoon marshmallow creme on remaining 6 slices of bread. Top peanut butter-spread bread with marshmallow-spread bread, marshmallow side down, making 6 sandwiches. Spray griddle or 12-inch skillet with cooking spray; heat to 350°F or over medium heat. 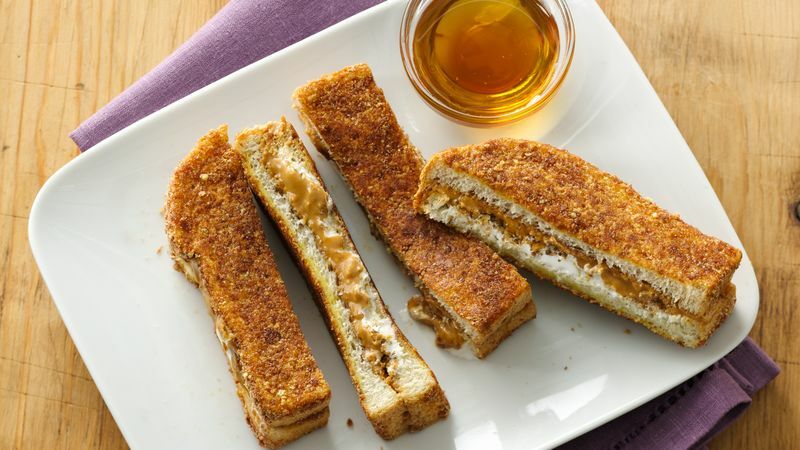 Dip each side of each sandwich into egg mixture, then coat each side with cereal crumbs; place on hot griddle. Cook 2 to 4 minutes on each side or until golden brown. Serve warm; if desired, serve with maple- or chocolate-flavored syrup. *To easily crush granola bars, do not unwrap; use rolling pin to crush bars. Reese’s trademark is a registered trademark of The Hershey Company used under license.